Smith-9th Street Rehab Pushed Back & Will Cost More! Coney Island/Stillwell Ave. bound F train entering the Smith-9th Sts. station on the & . Resized photo courtesy of Eye On Transit. It’s the same F-ing story at the crumbling Smith-Ninth Street station: repairs are going to cost more — much more — and take much longer. 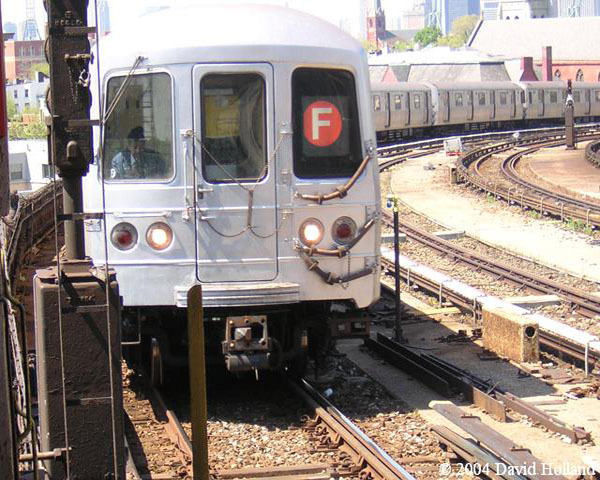 As recently as June, the Metropolitan Transportation Authority said it would spend $187.8 million to rebuild the elevated F and G tracks from Carroll Street to Fourth Avenue, and renovate the aging Smith-Ninth street station. The track work on the so-called Culver Viaduct is still scheduled to begin early next year and finish in 2012. But the renovation of the decrepit Smith-Ninth street stop — which requires closing the station for ninth months — has been pushed back to 2011 from 2010. Seriously does this come as a surprise to anyone reading this blog? I know it doesn’t surprise me. We all know the dire financial straits the MTA is in so hearing about projects being pushed back & eventually costing more should come as no surprise. Unfortunately with the history of the MTA being on the short end of the stick funding wise coupled with a crippling economy, these announcements will soon become the norm which is bad news for our infrastructure. Only if we could pinch ourselves awake to put an end to these nightmares.